The twentieth century experienced some of the worst instances of population displacement in history: the 15 million ethnic Germans forced out of their homes in Eastern Europe after World War II; the millions of Muslims and Hindus fleeing the newly established states of India and Pakistan during the partition of the Indian subcontinent in 1948; the millions of Armenians, Greeks, Turks, Finns, Bulgarians, Jews, and Kurds, among others, driven from their lands and resettled elsewhere. By contrast, the 600,000 Arabs who fled their homes in mandatory Palestine and the nascent state of Israel during the 1947-48 war have been kept in squalid camps for decades by their Arab hosts as a means of derogating Israel in the eyes of the West and arousing pan-Arab sentiments. And as if to add insult to injury, the U.N. Relief and Work Agency for Palestine Refugees in the Near East (UNRWA), established in December 1949 as a temporary means for relieving the plight of the newly-displaced refugees, has transformed into a permanent organization that has substantially exacerbated the problem whose resolution it was supposed to facilitate. The only Arab country to actually take legal and social steps to integrate the refugees into society was Jordan; its 1952 constitution stipulated that the refugees were Jordanian citizens by law. Although many Palestinians maintain that they are second-class citizens within Jordan, some have risen to unimagined heights such as Queen Rania, wife to the kingdom's current ruler, Abdullah II. 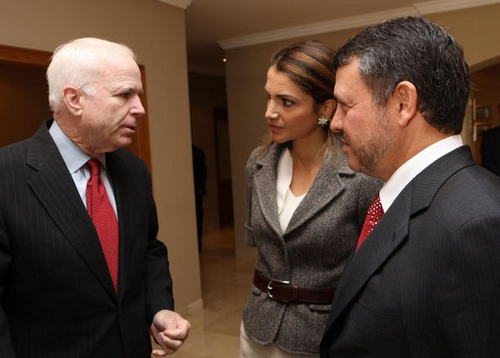 Here, King Abdullah II (right) and Queen Rania welcome U.S. Sen. John McCain (left) to the Royal Palace, March 18, 2008, Amman. The idea underlying the establishment of UNRWA was that "assistance for the relief of the Palestine refugees is necessary to prevent conditions of starvation and distress among them and to further conditions of peace and stability." Yet it was clear from the outset that these "constructive measures" were of a temporary nature and that "direct relief should be terminated not later than 31 December 1950 unless otherwise determined by the General Assembly at its fifth regular session." Within a year, however, it had become evident that UNRWA had no intention of folding up. Based on its operational report, on December 2, 1950, the General Assembly passed resolution 393 (V), which asserted "that direct relief cannot be terminated as provided in paragraph 6 of resolution 302 (IV)" and recommended that UNRWA's activities be continued "in preparation for the time when international assistance is no longer available, and for the realization of conditions of peace and stability in the area." The solution to the refugee problem that UNRWA's establishment was supposed to facilitate had been outlined by General Assembly resolution 194 of December 11, 1948, which envisaged the repatriation of the refugees and/or their resettlement in their host countries as part of a comprehensive peace settlement to be mediated by a soon-to-be-established three-member Conciliation Committee for Palestine (UNCCP). In line with this outlook, resolution 393 instructed the establishment of a $30 million "reintegration fund which shall be utilized for projects requested by any government in the Near East and approved by the Agency for the permanent re-establishment of refugees and their removal from relief." This sum was increased in January 26, 1952, to $100 million for the fiscal year July 1, 1952-July 1, 1953 (compared to a mere $18 million assigned to relief operations)—thus indicating the U.N.'s continued emphasis on resolving the refugee problem. Tasked by resolution 194 with facilitating "the repatriation, resettlement, and economic and social rehabilitation of the refugees and the payment of compensation," UNCCP suggested shifting funds assigned for compensation to resettlement because "the majority of the refugees can only hope to receive as compensation a much smaller sum than will be required to resettle them in the Arab countries." Moreover, "when the time comes to pay compensation, it is to be hoped that a large number of the refugees will already have been resettled by UNRWA." This was also the hope of U.N. secretary-general Trygve Lie, who said: "The refugees will lead an independent life in countries which have given them shelter … the refugees will no longer be maintained by an international organization … They will … provide for their own needs and those of their families." In a Jerusalem meeting on February 6, 1951, Sir Henry Knight, a member of UNRWA's advisory commission, reported some good news: "The prospects in regards to reintegration were not bad," he said. "Jordan seemed ready to accept a certain number of refugees; Egypt had already proposed a programme of public works, which more or less constituted a commitment on her part, and Mr. Tacla had implied that Lebanon would accept for resettlement 20,000 to 25,000 refugees of Lebanese origin." The overall plan was to offer the Arab governments vast resources and engage international experts in initiating sustainable agricultural projects that would change the economies of these countries while simultaneously absorbing the refugees. Because Syria, Jordan, and Egypt were in dire economic straits, UNCCP and UNRWA believed that they would ultimately accept the U.N. money that came with the programs and resettle the refugees. The Israeli proposal was rejected by the Egyptian government, which demanded that all the refugees in Gaza be allowed to return to their villages in southern Israel. Confronted with this rebuff, Prime Minister David Ben-Gurion dismissed the Egyptian demand out of hand and insisted that the Arab states resettle the refugees in their own countries. By the early 1950s, it became increasingly clear that repatriation was no longer an option. John B. Blandford, chairman of UNRWA's advisory commission, acknowledged this in a confidential memo: "There is probably common agreement that there is no gain for either of our efforts in fanning anew the fires and hopes of repatriation … It would seem desirable that the refugees be fully and promptly informed." This left resettlement as the only possible solution. On January 26, 1952, the General Assembly passed resolution 513 (VI) allocating "the expenditure of US $50 million for relief and $200 million for reintegration … to be carried over the period of approximately three years starting as of 1 July 1951." The resolution asked UNRWA to "explore with the governments concerned the desirability and practicability of transferring administration of relief to those governments at the earliest possible date …[and] considers that relief expenditures should be reduced in suitable proportion to reintegration expenditures." Later that year, Blandford asked for an additional $30 million for reintegration projects as a means to reduce UNRWA's budget for relief. To a limited extent, the constructive aims of the resolution were accepted. Egypt offered area in the Sinai for 10,000 refugee families if water could be found and if there was no prejudice to refugee interests with regards to repatriation or compensation. Jordan also agreed to the use of the fund for small projects with similar political qualifications. Soon, the first constructive steps were taken; out of these initial operations came knowledge of the area, surveys, irrigation plans, economic planning experience, and some progress on the ground. U.N. secretary-general Lie maintained his optimism: "The Arab States would have a change of opinion, and they would recognize the inevitability of reintegration of refugees elsewhere than in Israel." Resettlement seemed most logical and natural in Jordan, which in 1950, annexed the territories of Judea and Samaria (which subsequently became the West Bank of the Hashemite kingdom of Jordan) where most of the refugees were based. In 1952, the Jordanian constitution stipulated that the refugees were Jordanian citizens by law, and in 1954, a new law was enacted (6/1954) confirming the status of those who had acquired Jordanian citizenship under the previous law (56/1949). In stark contrast, the rest of the Arab states refused to grant citizenship to refugees on the pretext of preserving their "right of return" to Palestine. Resolution 513 of January 1952 also instructed UNRWA "to explore with the governments concerned arrangements looking towards their assuming administration of reintegration projects at the earliest possible date." But the charge was spurned by the Arab regimes and prevented the creation of a unified working coalition needed to achieve economic development for the region as a whole. But optimism did not wane due to the lack of real progress. Reporting to the eighth session of the General Assembly on October 26, 1953, the acting director of UNRWA, Leslie J. Carver, argued that "it was practically impossible to bring about the rehabilitation of all Arab refugees in the existing economic and political circumstances. There was, however, a prospect that, by their early employment on projects under consideration by the host governments and UNRWA, many refugees would be able to become self-supporting." The U.S. government was also involved in the resettlement plans. President Truman's International Development Advisory Board worked on resettlement options and concluded that "under proper development, Iraq alone could absorb an Arab refugee population of 750,000 people." Encouraged by this general spirit of optimism, the General Assembly increased the resettlement fund from $250 million to $293 million. With this impressive budget in hand, UNRWA drafted resettlement plans based on the principle that the projects would be carried out by the refugees, and this would, in addition, solve the problem of unemployment. UNRWA also prepared training programs for them. The reintegration fund would also give loans and grants to refugees to enable them to establish small enterprises, would build houses near their employment, establish rural farms where land was available for cultivation, and construct irrigation works and access roads. The plan promised the refugees economic, social, and political independence while the host countries would gain economic development and prosperity. With the July 1952 Free Officers' putsch in Egypt and the Soviet Union's assertive moves into the Middle East, Washington began to take more of an interest in greater progress on this front. Eisenhower's secretary of state John Foster Dulles felt his first priority was to convince the Arab world of Washington's evenhandedness and suggested resettlement of the refugees should be divided between Israel and the Arab states: Israel would repatriate a fixed number of refugees while the Arab states would absorb the remainder. It was hoped that Israel and its neighbors would "share water resources on an equitable basis and agree to border adjustments." Eisenhower appointed a team of experts, headed by U.S. ambassador Eric Johnston, which developed the "Jordan Valley Unified Water Plan" (the "Johnston Plan") for the resettlement of thousands of refugee families. Though the plan was rejected by the Arab League, both Israel and Jordan were eager to implement their respective components, resulting in the establishment of Israel's National Water Carrier and Jordan's East Ghor Main Canal (today the "King Abdullah Canal") project—but not in a durable solution to the Palestinian refugee problem. Before long, UNCCP and UNRWA reports lamented the slow progress of resettlement plans on the one hand and the waning prospects of repatriation on the other. "The refugees should be made to understand that previous U.N. resolutions and Arab League pledges guaranteeing their right of return were hopeless," noted an internal U.S. diplomatic memorandum. "It would be near impossible for them to dream of returning to Palestine in large numbers. The refugees would then be made more receptive to the principle of resettlement." Signs of progress on major schemes are unfortunately lacking. The time taken to negotiate programme agreements with governments has been far longer than was expected when the three-year plan was originally conceived. … The time required for the preliminary engineering work involved in the preparation of specifications plans and designs for a major project must be measured in months, and the construction of a large dam or hydro-electric plant and of the main and subsidiary irrigation canals, in years … it will be several years before the full benefits of the projects can be achieved. For the most part, resettlement options in the Arab host countries went from poor to nonexistent. Keeping the 200,000-250,000 Palestinian refugees in harsh conditions in the Gaza Strip, the Egyptian government refused to grant them citizenship or to settle them elsewhere in the country on the pretext that "Egypt was densely populated and unable to extend substantially the area of its arable land … it would be difficult to resettle a number of refugees on its existing territory." Similarly, the Lebanese government refused to integrate the 100,000 refugees into Lebanese society because it did "not feel that there are opportunities for refugees to become self-supporting … there are therefore no new programme projects in Lebanon at present." Syria was another disappointment. In 1950-52 there were hopes for a successful resettlement of some 80,000 refugees in the country, and UNRWA initiated the construction of housing projects in Damascus. However, the Syrian government rejected UNRWA's pilot project proposals and refused to make state domain land available for the permanent resettlement of refugees. The only exception to this rejectionist pattern was Jordan where the government took legal and social steps to integrate the refugees into society. King Abdullah's goals were less than altruistic; he wished to expand his kingdom through annexation of what would come to be known as the West Bank as well as to reap a windfall of financial and technical assistance. As early as July 1949, the Jordanians informed UNCCP and Israel of their intention to resettle 200,000 refugees in return for substantial financial support, and two years later, Jordan and UNRWA signed an agreement "for Palestinian refugees in the Near East," and the Hashemite kingdom was promised generous loans and grants "with a view to raising the general standard of living of all inhabitants including refugees." In cooperation with UNRWA, the Jordanian government completed a 200-unit housing project for refugees, a large undertaking by a development bank with approved capital of 400,000 Jordanian dinars provided by UNRWA; some small training projects were also expanded into a $1 million vocational program. Despite U.S. satisfaction with these modest beginnings, the assassination of King Abdullah (on July 20, 1951) made his more ambitious plans to resettle all the refugees who had fled to the West Bank and Jordan quite difficult to achieve. Several major obstacles hindered the execution of the resettlement plans. As noted above, the Arab League and the Arab governments adamantly objected to resettlement despite the offer of substantial economic incentives, showing total indifference to the suffering of the Palestinians. Instead, the Arab League demanded repatriation of all refugees to their original homes in Israel: "Arab countries are unable to take on full responsibility for the quest for international peace as long as the refugee problem exists, and they have done their best in order to solve this problem … [T]he international community must take on this burden, in accordance with the Charter of the United Nations." it was not only the result of lack of preparedness … or general Arab economic and social underdevelopment. This weakness was much more a result of the Arab minimalist approach towards human rights in general, including the rights of the refugees. The concept of individual rights and the protection of those rights, not to mention the specific protection of refugees, were completely absent from the Charter of the Arab League … For a long time, the Arab League focused its attention on Israel's practices against the Palestinian people without paying attention to the Arab conduct towards Palestinian refugees. Strikingly, a 1961 UNCCP report revealed that it was Israel that apparently made good faith efforts to ameliorate the refugee situation. After detailing the lost opportunities for resettlement resulting from failed negotiations with Egypt, Saudi Arabia, Jordan, Iraq, Syria, and Lebanon, the report testifies that alongside the previously mentioned offer vis-à-vis Gaza, "Ben-Gurion did not exclude the possibility of accepting for repatriation a limited number of Arab refugees, but he made it clear … that a real solution of the refugee problem lay in the resettlement of the refugees in Arab states." With prospects for resettlement frozen, UNRWA abandoned those efforts and became a giant service-providing bureaucracy. In 1952, its director stated that it was "the largest food purchasing organization in the entire Near East." The organization's budget for relief increased from $27 million in 1952 to almost $80 million in just a few years. The major beneficiary of its operations was Jordan, which received additional aid from the United States and Britain. It is, therefore, not surprising that the Arab League saw in UNRWA not only an important asset that could be used against Israel (through the perpetuation of the refugee problem) but as a cash-cow to be milked by Arab regimes. In particular, UNRWA helped the Arab League uphold its strategy of promoting Palestinian statelessness for its own purposes. "Whereas the Arab League did not adopt a resolution forbidding the granting of citizenship by member states to Palestinian refugees," wrote Aza'r, "it expressed, at the same time, its general desire to … preserve their Palestinian identity and their political rights." UNRWA's continued distribution of refugee-ID cards to refugee descendants thus supported the Arab League's approach of barring citizenship for Palestinians in the Arab states. Undoubtedly, UNRWA's misinterpretation of its original mandate as well as its unprecedented redefinition of "refugee" contributed to the failure of its early resettlement plans. In 1959, Dag Hammarskjöld, the second U.N. secretary-general, pointed out that the organization had adopted a definition of a Palestinian refugee with no legal basis: "UNRWA's working definition of a person eligible for its services ... is not contained in any resolution of the General Assembly but has been stated in annual reports of the director and tacitly approved by the assembly." Yet it was not until 1982 that UNRWA requested the General Assembly to legalize its longtime misconduct and "to issue identification cards to all Palestine refugees and their descendants, irrespective of whether they are recipients or not of rations and services from the Agency." At the end of the 1948 Israeli-Arab war and throughout the 1950s, once it became clear that repatriation was not an option, UNRWA vigorously pursued and indeed succeeded in resettling hundreds of thousands of refugees in Jordan, Gaza, and the West Bank. However, large-scale plans that would have resolved the problem once and for all were not implemented. Several factors contributed to this failure. To begin with, the $300 million budget approved in 1951 was insufficient for the extensive economic development schemes. The plans demanded vast investments in regional water and irrigation projects as well as in advanced agricultural systems. Moreover, the assumption that such complex projects, involving states still not at peace with each other, could be completed in three years was unrealistic as was the belief that supplementary funds would be coming from the host states and neighboring oil-producing countries. As a result, comprehensive resettlement plans based on vast economic development projects were abandoned in the late 1950s. A misperception of the ultimate goals of key players played a determining role in this failure. Both UNCCP and UNRWA wrongly assumed that reintegration and resettlement were economic, not political processes. The Arab states thought otherwise and made it clear that resettlement of the refugees outside of Mandate Palestine was a political issue that could be exploited at will. As one Arab U.N. representative put it, successful resettlement initiatives "would include the supposition that the Palestine problem is, at long last, solved—and this is far from being the case …[T]his solution … is no more than an effort to justify Jewish immigration into Palestine by another immigration of Palestine refugees into the Arab countries. This idea is profoundly shocking to us." Throughout the years, tens of thousands of Palestinian families—over two thirds of the population—have left UNRWA-administered "refugee camps" and resettled in Jordan, the West Bank, and other countries outside of the Middle East with many becoming citizens of their host countries. Only a minority of the descendants of the original 1948 families still reside in the camps, mostly in Syria, Lebanon, and Gaza. Yet UNRWA continues to keep these resettled persons on its refugee rolls with its most recent 2010 records showing about five million "refugees" and ignoring the fact that close to three and a half million people are fully resettled. The same reports indicate that less than a million-and-a-half people reside in areas designated as "refugee camps." Notwithstanding this fact, UNRWA has created, during its sixty-two years of operation, a vast bureaucratic network of some 30,000 Palestinian employees with full tenured benefits, who, in turn, provide social services to millions of Arabs regardless of their legal or economic eligibility. Consequently, UNRWA, the Arab host states, and especially the Palestinian Arab beneficiaries have a vested interest in perpetuating the organization's operation and keeping alive the fiction of millions of needy Palestinian refugees. UNRWA's current operations are neither benevolent nor humanitarian. The agency functions as a "non-territorial government," perpetuating the false idea that five million Palestinians are still refugees and in need of humanitarian assistance. As such, UNRWA's existence is harmful to all players involved: Israel is criticized for not resettling the "refugees," the Palestinian Authority is denied governing its own citizens, and donors give billions to a nonexistent cause, money that should have been used to help genuine refugees in real distress. UNRWA's operation has to be phased out gradually and carefully. Within this framework, Egypt, Syria, and Lebanon have to award full citizenship to all the Palestinians who have resided in their territories for generations (Jordan has already done it). UNRWA, with the help of the U.N. High Commissioner for Refugees, the International Labour Organization, and other international organizations, should transfer all its facilities (schools, medical clinics, etc. ), as well as most of its employees to the local governments' educational and health systems while those donors wishing to continue their support of the Palestinians should negotiate their assistance procedures directly with the relevant Arab governments. The phasing out of UNRWA's operation is vital to the peace process and the stability of the region. Nitza Nachmias teaches in the master of arts program on conflict resolution at Tel Aviv University. Efraim Karsh, "How Many Palestinian Arab Refugees Were There?" Israel Affairs, Apr. 2011, pp. 224-46. U.N. General Assembly (UNGA) res. 302 (IV), Dec. 8, 1949, para. 7. UNGA res. 302 (IV), Dec. 8, 1949, para. 6. UNGA res. 393 (V), Dec. 2, 1950, paras. 2, 4. UNGA res. 194 (III), Dec. 11, 1948, paras 2, 11. UNGA res. 393 (V), para. 5. "Preliminary note concerning the financial relationship between compensation and resettlement," U.N. Conciliation Committee for Palestine (UNCCP), A/AC.25/W/64, Apr. 30, 1951. "Memorandum by the Secretary-General to the Ad Hoc Committee on Statelessness and Related Problems," U.N. doc. E/AC, Jan. 3, 1950, pp. 6-7. "Summary Record, a Meeting between the Conciliation Commission and the Relief and Works Agency," UNCCP, Feb. 6, 1951, A/AC.25/SR.204. Alexander Joffe and Asaf Romirowsky, "A Tale of Two Galloways: Notes on the Early History of UNRWA and Zionist Historiography," Middle Eastern Studies, Sept. 2010, p. 661-2. "Historical Survey of Efforts of the UNCCP to Secure the Implementation of Paragraph 11 of G-A Resolution 194(III)," A/AC.25/W.82/Rev.1, Oct. 2, 1961, p. 5; "Third Progress Report," U.N. Conciliation Commission for Palestine, June 21, 1949, A927. David Ben-Gurion, Medinat Israel Hamehudeshet (Tel Aviv: Am Over Press, 1969), pp. 292-312. "Historical Survey of Efforts of the UNCCP," Oct. 2, 1961, p. 5. John B. Blandford, Jr., "Confidential Memorandum," no. 18, Jan. 30, 1951. Report of the director, UNRWA, Jan. 26, 1952, UNGA res. A/Res/513 (VI), para. 2. Quoted in Joffe and Romirowsky, "A Tale of Two Galloways," p. 661. Jordanian constitution, Hashemite Kingdom of Jordan, Jan. 1, 1952, art. 5. Jordanian Nationality Law, 1954, Hashemite Kingdom of Jordan, Jan. 1, 1954. Mohamed Y. Olwan, "Migration Trends and Patterns in Jordan: The Human Rights Context," American University in Cairo, School of Global Affairs and Public Policy, Center for Migration and Refugee Studies, Oct. 10, 2011, pp. 2-3. Report of the director, UNRWA, Jan. 26, 1952, para. 4. "Political and Security Questions: J. The Palestine Question: Communications and Reports Received by the Security Council: a. Report of UNRWA," Yearbook of the United Nations 1953, Dec. 31, 1953.
 International Development Advisory Board Report, Mar. 7, 1951, cited in "Palestinian refugees were denied resettlement opportunities," Eretz Yisrael.org, excerpted from Joan Peters, From Time Immemorial: The Origins of the Arab-Jewish Conflict over Palestine (Chicago: JKAP Publications, 2001). Report of the director, UNRWA, July 1, 1951 to June 30, 1952, UNGA A/2171, part IV. Peter L. Hahn, Crisis and Crossfire: The United States and the Middle East since 1945 (Washington D.C.: Potomac Books, 2005), p. 29. Jeffrey Sosland, Cooperating Rivals: The Riparian Politics of the Jordan River Basin (New York: SUNY Press, 2007), p. 70. Memorandum by the U.S. charge d'affairs in Jordan, quoted in Ghada Hashem Talhami. Palestinian Refugees: Pawns to Political Actors. (New York: Nova Science Publishing, 2003), p. 62. Report of the director, UNRWA, July 1, 1952 to June 30, 1953, UNGA A2470, para. 11. UNCCP report to the General Assembly, Dec. 11, 1949 to Oct. 23, 1950, UNGA A/1367/Rev.1. Report of the director, UNRWA, July 1, 1951 to June 30, 1952, para. 62. Report of the director, UNRWA, Sept. 28, 1951, UNGA A/1905, para. 79. David Meir-Levi, "Syria and the Palestinian Refugee Problem," InFocus Quarterly, Spring 2009. Jalal al-Husseini, "The Arab States and the Refugee Issue: A Retrospective View," Beiträge zum ausländischen öffentlichen Recht und Völkerrecht, vol. 189, part 8, 2007, p. 4. Report of the director, UNRWA, Sept. 28, 1951. Report of the director, UNRWA, July 1, 1951 to June 30, 1952, para 67-8. Quoted in Mohammad Khaled al-Aza'r, "Arab Protection for Palestinian Refugees," BADIL Resource Center for Palestinian Residency and Refugee Rights, Bethlehem, Nov. 2004, p. 5. Mitchell Bard, "The Palestinian Refugees," The Jewish Virtual Library, accessed June 13, 2012. Aza'r, "Arab Protection for Palestinian Refugees," p. 4. "The Question of Reintegration by Repatriation or Resettlement," UNGA A/AC.25/W.82/Rev.1, Oct. 2, 1961, para. 8. Report of the director, UNRWA, July 1, 1951 to June 30, 1952, para. 10. Aza'r, "Arab Protection for Palestinian Refugees," p. 14. "Proposals for the Continuation of the United Nations Assistance to the Palestine refugees," UNGA A/4121, June 15, 1959, part II, para. 4. "Working Group on the Financing of the United Nations Relief and Works Agency for Palestine Refugees in the Near East: I. Special identification cards to all Palestine refugees," UNGA A/RES/37/120, Dec. 16, 1982. F.M. Gottheil, "UNRWA and Moral Hazard," Middle Eastern Studies, May 2006, pp. 411-2. "The Question of Reintegration by Repatriation or Resettlement," UNGA A/AC.25/W.82/Rev.1, Oct. 2, 1961, para. 118. UNRWA Statistics 2010, Programme Coordination and Support Unit (Amman), UNRWA, Nov. 2011, p. 4. Related Topics: Palestinians | Nitza Nachmias | Fall 2012 MEQ receive the latest by email: subscribe to the free mef mailing list This text may be reposted or forwarded so long as it is presented as an integral whole with complete and accurate information provided about its author, date, place of publication, and original URL.